The village elder won't hear of such foolishness and punishes the Brigade. However, when disaster strikes from the world above and the entire village is in jeopardy, it's up to Simon, Kamina, a girl with a big gun named Yoko, and the small yet sturdy robot, Lagann, to save the day. The new friends journey to the world above and find that the surface is a harsh battlefield, and it's up to them to fight back against the rampaging Beastmen to turn the tide in the humans' favor! 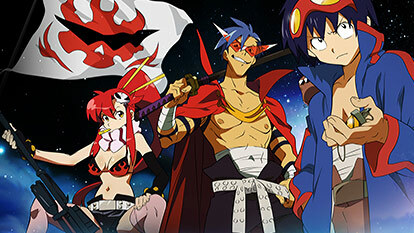 Pierce the heavens, Gurren Lagann!